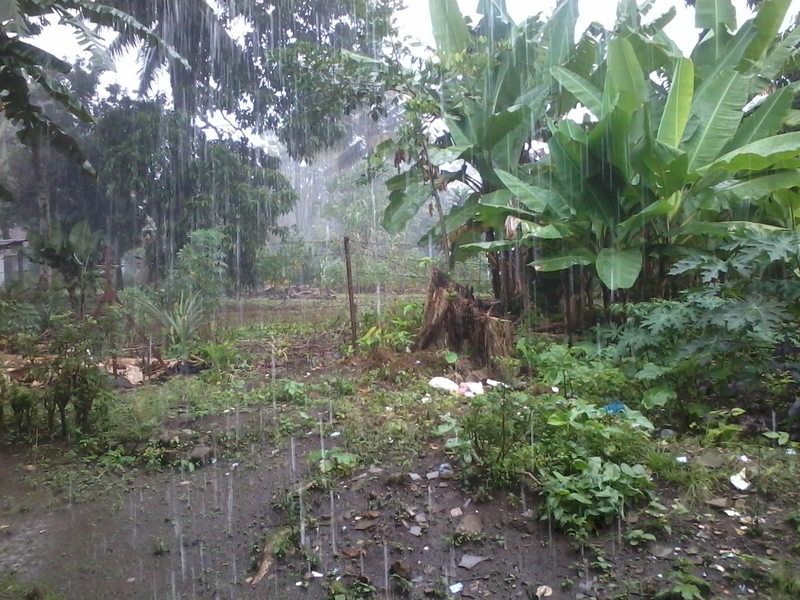 Downpour during the rainy season in Sumatra. As much as I’m looking forward to spending my holidays in North America, I’m kinda loving this tropical climate at the equator. The daily warm sun, the ever growing plants and trees, abundance of fruit all year round, and even the torrential rains which are now more often than in June. Here is no bleak midwinter—it is now the rainy season—and although we can still light candles in the night, the amount of daylight is nearly the same as it was 6 months ago. The beginning of this month I was stressed with the thought of not being able to get back to my homeland. I was waiting for several months for just one piece of paper from the Labor Department to finally complete the process to renew my work visa. It was agony, and I grew weary of waiting. The immigration office said the policy was to hold my passport, so during a span of four months, I was without it. Without a passport, of course, I wouldn’t be able to board my flight. I angrily rejected that my waiting had anything to do with the gentle and hopeful preparation for the coming of Christ. I felt my waiting was an injustice, that I was stuck in between nightmarish bureaucracy and a corrupt government. I didn’t get in the ‘spirit’ of the season, and I’m still trying to return to a place of spiritual centering. I’m still waiting for that document, but at least now I have the ability to spend some time at home. It has been 20 months since I left the US and haven’t been out of SE Asia during that time. In my absence there and presence in Indonesia, life has happened for my family and friends, too. Babies were born; my grandfather passed away; there were marriages and divorces; other friends moved locations, or got new jobs. So much life, here and there. Here, in Balige, the small Christmas tree next to my office is some pine branches stuck into the stalk of a banana tree. If you stand at a distance, you probably couldn’t tell the creativity to create the holiday look. An advent wreath hangs from the awning above the common area outside my office. I write now with my door open; birds are chattering, roosters crow, and the sun is out. This is Advent in Sumatra. 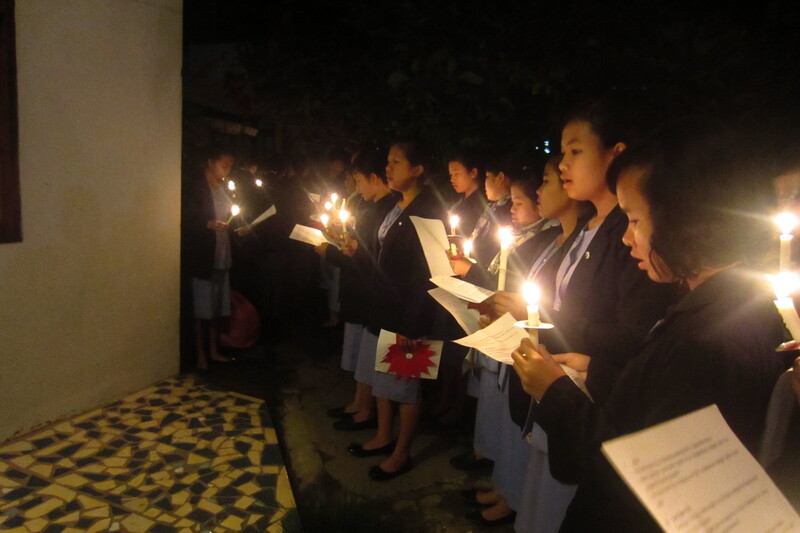 Caroling at 4am in Balige to start the Advent season. We, too, prepare our hearts for the coming of Christ but the individualism and consumerism that pervades American culture isn’t present in Indonesia. We don’t need a break from shopping malls or advertisements, or holiday rush. Not every home will give and receive presents—but that isn’t the focus of Advent and Christmas for the Christians here. Actually, it is worship in the church that is the focus. Preparations for role-plays are being made, decorations are up, special hymns are sung. On Sunday December 1st, the first week of Advent, I once again joined my students for pre-dawn caroling around town with candles. It was a beautiful way to welcome the season, and I am grateful for the opportunity to join them again this year. We walked while singing, and placed wreaths and several homes. But there are more signs down here at the equator. The growing season never stops and the rain comes more often. 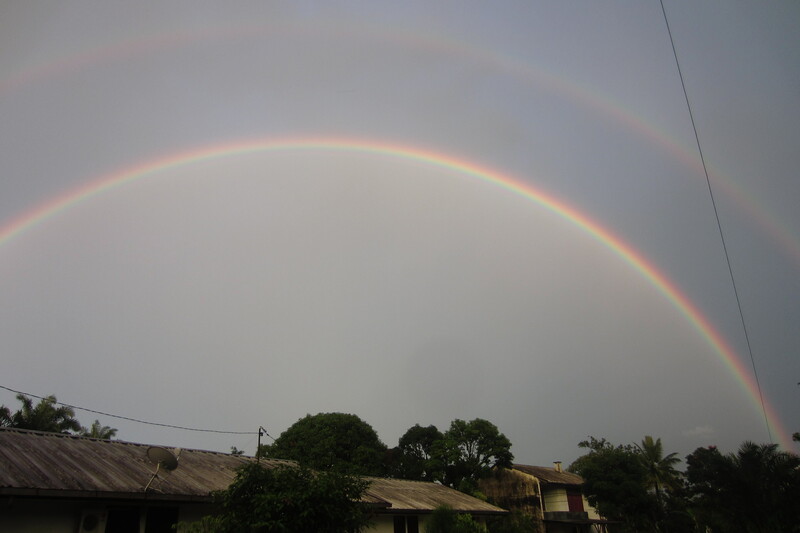 A few weeks ago, I found myself, for the first time, staring directly at a full double rainbow. It gave me pause. Perhaps it’s a challenge to meditate on this Advent, for you in the northern climates. It’s not a typical symbol of Advent for the church, but in my time of anger and restless waiting, it gave me hope and brought me some joy in that bleak midwinter in my heart. And that is Advent. Blessed Advent and happy holidays to all who are celebrating this month.